That time of the year again: The FA Cup Semi-Final weekend! Passion, hysteria, triumph and tribulation; it’s none other than FA CUP Semi-Final Weekend! Four teams will battle it out on the hallow Wembley turf to write themselves into the English history books; an FA Cup Final. With ninety thousand screaming fans watching and millions around the world – there is not a better stage to make yourself a hero. Three of the four teams are established Premier League teams, all glittered with FA Cup history. 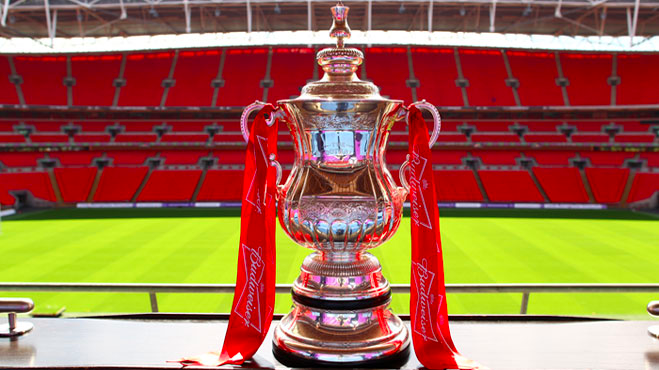 Arsenal – 11 time winners and Liverpool and Aston Villa both 7 time winners.The underdogs, Reading are lie 18th and are struggling in the Championship but the magic of the FA Cup is where such things (upsets) happen! Reading are looking to spoil the party against Arsenal, who are the clear favourites on Saturday. The all-Premier League tie between two young British managers, Sherwood and Rodgers sets up the second semi-final as a tasty one, all with a dream to get to the Final; it could be anyone’s on their day to bring the trophy home! Expect tears, laughter, and drama. A last minute goal, or a conspicuous hand-ball that wasn’t given. A place in the final is on a knife-edge. Don’t miss out! ParkJockey has a number of car parks around the stadium, and be sure to grab your space soon because SPACES ARE FILLING UP QUICKLY! This entry was posted in London, ParkJockey and tagged Arsenal, FA Cup, FA Cup Semi-Final, football, London, parking, Reading, Wembley, Wembley Stadium on April 13, 2015 by ParkJockey Team.